Sept. 7, 2016 | 7:20 a.m. Toxic algae blooms can be accompanied by hard-to-miss odors and layers of scum. One organism, exploding in population, thrives at the expense of others in its ecosystem. That's essentially what happens when a toxic algal bloom spreads a slimy, stinky trail across a body of water. The organism responsible for this onslaught is cyanobacteria, one of the earliest and most-widespread forms of life on the planet. Commonly called blue-green algae, it is actually a type of bacteria that relies on photosynthesis and is a common inhabitant of surface waters, including lakes and ponds. Elements like phosphorus and nitrogen that cyanobacteria require occur naturally in the environment, but usually not in quantities that support a massive bloom. That issue is becoming more common, though, as humans provide massive extra helpings of those nutrients, mostly in the form of runoff from farms. Environmental scientists call this problem nutrient pollution. As a cyanobacteria bloom expands in a body of water, it blocks the sunlight that other microorganisms and aquatic plants need to survive. Some species of these bacteria produce cyanotoxins that are dangerous to both animals and humans. And as individual cyanobacteria die, other bacteria metabolize their remains, in the process consuming so much oxygen that they deplete the water's oxygen supply, killing off fish and other aquatic animals. The algal blooms and resulting decay emit a revolting stench, driving away the enticements of lakeside recreation and threatening human health. 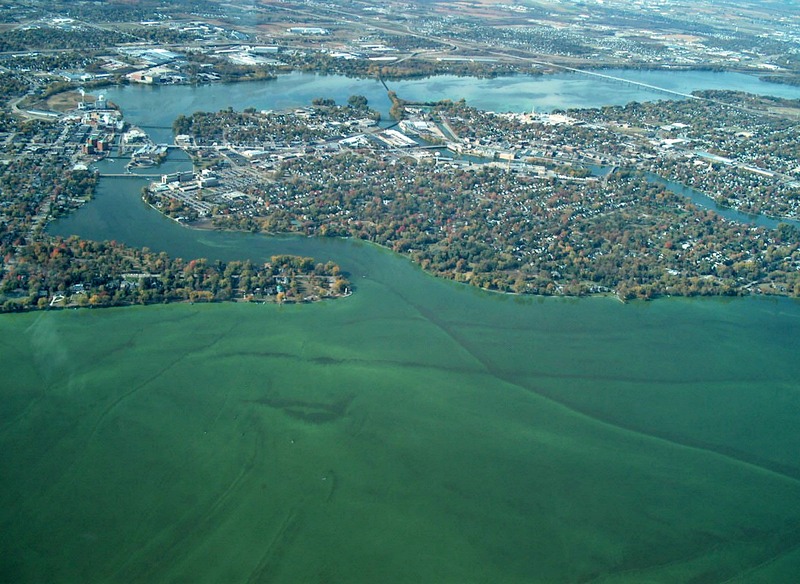 Algal blooms and the phosphorus that support them are a pivotal issue in the Madison area and surrounding Yahara Watershed, comprising the eponymous river, the five lakes it connects, and associated springs, creeks and wetlands. The role of phosphorus in the watershed is a central factor in the computer models researchers in the Yahara 2070 project are using to understand the future of the region. Wisconsin Public Television explores this project in its new documentary Yahara 2070: A Place Of Change. The amount of phosphorous in the Yahara Watershed has increased by a factor of 10 since urban settlement and rural agriculture started to transform the region in the 1840s and 1850s, said Stephen Carpenter, head of UW-Madison's Center for Limnology and a member of the Yahara 2070 research team. People in the Madison area likely encountered their first cyanobacteria bloom in the 1880s. Back then, though, the problem was not farm runoff but human waste — the city had not yet developed a sewer system, so waste went into the lakes and river. In fact, it wasn't until the 1970s that the entire Yahara region had access to modern wastewater treatment. "Lake Monona had the worst sewage input," said Carpenter. "[In the 1930s], there were people out there spraying copper sulfate and other algicides, which obviously didn't solve the sewage problem, but at least it made the algae die and sink." While the sewer system improved, though, the watershed encountered a new source of nutrient pollution: The growing use of phosphorus- and nitrogen-based fertilizers on farms throughout the area, carried into surface waters by precipitation runoff. By about 1970, environmental scientists knew that elevated phosphorus levels were a culprit in cyanobacteria blooms. Farmers and policymakers have responded by taking a few steps forward and a few more back. "There have been a number of land-management practices put in place that are designed to slow down the transport of phosphorus to the lakes," Carpenter said. "That's a change that should move us in the right direction. Manure production, however, has gone up, so we're dealing with more manure [which is rich in phosphorous]. The intensity of precipitation has increased, so we're seeing not so much more rain, but the rain we're getting is coming in bigger storms, and those bigger storms erode more material. Finally we're seeing more conversion of land to land that erodes fast, to impervious surfaces like roads and parking lots." The storms aren't a human action, of course, but they still reflect the impact of climate change. "In Wisconsin we're now quite certain that we're seeing stronger storms," Carpenter said. "It almost doesn't matter whether you're a climate denier or not — there's stronger storms. There they are!" A heavy rainstorm can push a lot of phosphorus into lakes and streams all at once. In fact, Carpenter considers this phenomenon climate change's biggest contribution to the toxic cyanobacteria problem. "It's also true that warmer water generally favors cyanobacteria, but that relationship's actually fairly subtle and complex," he said. "But the rainfall relationship is strong and I would say the most important factor." Toxic algal blooms may announce themselves with hard-to-miss odors and layers of scum that can sometimes be seen from space. But scientists don't have effective tools to monitor their effects. It's also tough to anticipate when a bloom will occur, even though the conditions that favor their development — warm water and high levels of nutrients — are generally understood. A cyanobacteria bloom colors the waters of Lake Winnebago at its outlet into Little Lake Butte des Morts and the Fox River, between Neenah and Menasha. Different types of cyanobacteria will release different toxins, depending on their genetic makeup and environmental conditions, and some blooms release no toxins at all. "It won't always be toxic when it's greenish, and sometimes it's possible that it would be toxic before you can detect that greenish-blue color," said Katherine McMahon, a professor of civil and environmental engineering at UW-Madison. She studies cyanobacteria that can produce toxins without forming visible blooms. McMahon pointed out that microbiologists don't exactly know why or how these organisms produce toxins. "The best that we can say at this point is they don't always do it," she said. "They seem to do it when they are growing quickly and when their blooms are forming." Madison and Dane County officials carry out routine tests for harmful bacteria in the Yahara watershed, but McMahon says these measurements are fairly crude. More sensitive methods exist, but are not widely available. A proper test for specific cyanobacteria toxins in a freshwater sample can take about two days to complete, requiring specialized equipment and trained scientists to interpret the results. Both McMahon and Carpenter said it's important for scientists to develop better testing methods for assessing algal blooms, so that health and environmental officials can take quicker action when cyanobacteria get out of control. "There are 15,000 lakes in Wisconsin," Carpenter said "The need for this is just way out of whack with our capabilities." The Yahara 2070 project used four distinct stories to explore the hypothetical future of the watershed. Each one is literally near-term speculative fiction, complete with characters who refer to the area as "Yahara" rather than "Madison." But they're based in scientific terms of cause-and-effect, building on the behaviors, positive and negative, that people in the area might realistically pursue over the next half-century. One scenario, called "Abandonment and Renewal," posits that farmers scramble to keep up with growing demand for food and fodder, but without changing their agricultural practices. The resulting phosphorus runoff fuels a massive algal bloom that is posited to kill thousands of people and drives the population to abandon the Madison area. In short, this story is built on the concept of runaway growth followed by a crash. In this scenario, the cyanobacteria is a new species, one that does not exist in the present day, that can actually emit toxic fumes. This idea is not beyond the realm of possibility, as some bacteria do produce large amounts of gas. However, Carpenter said he does not know of any cyanobacteria species that currently emit their toxins in gaseous form. The organisms themselves could possibly be inhaled, though, in the spray from a motorboat for example. In fact, some researchers have tried to figure out whether inhaled cyanobacteria have contributed to the degenerative nerve disorder ALS. McMahon is skeptical of the deadly algal-bloom scenario. Cyanobacteria blooms can get pretty large in scale and threaten the health of aquatic ecosystems, but there are limits to how big they can get. If there are too many microorganisms crowded into a lake, they can't all get enough sunlight and many will die. Additionally, there are viruses that prey on cyanobacteria blooms that reach a certain density. These organisms also need warm conditions to grow. "I think the global-warming scenario would have to be just unbelievably extreme," McMahon said. Even the worst cyanobacteria catastrophes in history so far look nothing like the Yahara 2070 scenario. A 2014 algae bloom on Lake Erie cut off hundreds of thousands of people in Toledo, Ohio from their municipal water source. An even more massive bloom in 2007 on China's Lake Taihu, fueled by industrial waste, disrupted the drinking water supply for more than 2 million people. Still, neither event brought mass death or displacement. "I don't know of any lake in the world where it's gotten to the point that people have had to abandon a region because of the cyanobacteria blooms," McMahon said. Apart from having much smaller lakes, residents of the Yahara region also don't rely on lakes or rivers for drinking water. Madison-area residents get their drinking water from municipal systems that use shared groundwater wells, while more rural areas rely on private wells. Surface water can affect groundwater quality, but Carpenter does not expect phosphorus to become a significant groundwater problem. Even short of a hypothetical catastrophe, though, phosphorus and cyanobacteria have a visible (and smellable) impact on the health of the Yahara Watershed. The state of the river, streams and lakes, in turn, directly affect quality of life, health, and the economy of the Madison area. Algal blooms exemplify the human impact on surface water quality, and highlight the consequences of how all people rely on agriculture for their food.